“We need to have a doorbell too!”, I reminded my husband of another item as he was scribbling the shopping list. We used to be very busy those days. Being a newly wed couple, my husband & I were busy setting up our sweet home. We had to buy anything and everything - from washing machine to a cloth stand, from tea set to linen. Shopping was almost daily activity. We would pick things, have discussions over it and then make our mind to buy it or not. Sometimes, we would fight like kids when one of us wanted to buy something and gave funny reasons to buy that. And, the other one would subtly assume the role of discerning parent trying to reason with the partner turned kid. We both are software professionals and have an “arranged” marriage – by the book. Although, both of us fancied love-marriages as most of our friends have had. He had come with his family to meet the first time. Both of us have background of service class families, similar culture, same dreams, same aspirations as well as same hobbies so much so that at our very first “arranged” meeting, both of us being avid readers having strong opinions, had an argument over Paulo Coelho’s The Alchemist. “It’s the best book ever written!” he declared. “well, I think it has some highly impractical and philosophical tones”, I smirked. Both of us are hazy eyed, dreamy romantics but with different choices. So no wonder that we had our differences for our honeymoon destinations too. He liked the serenity and evening of desert and I enjoyed the sea breeze of beaches. “Hey, I liked this one”, I said with a childlike gleam in my eyes with excitement. We were at Hometown, a home-shopping complex and from the display panel of doorbells we started playing each one. It was fun. “Hmm and tell me, how about this?” he played another - an English instrumental whereas I was keen on the Gayatri Mantra, I had just played. Well, he had all regards for the holy chant but he said, “It’s too common - the mantras bell. But look, this one is melodious and I have rarely found this music in a bell. I really like this.” he remarked with his million dollar smile. “Hmm, but I have heard mantras bell with half-finished prayers or bhajans unlike this one and just imagine Gayatri Mantra playing whenever a guest presses the doorbell. So, divine!” I reasoned. I used to get sad about the differences in our likes (and dislikes). If you ask, why did we agree to marry, answer simply would be because we thought its life and not a Bollywood movie, besides, our families seemed to bond together perfectly. We were silent and were trying both the bells again and again. “We can take this”, “It’s not that bad”, “I think I like this now that I have listened to it again”, we both were now rooting for each other’s favorite number. As luck would have it, Hometown people did not have the bells other than the ones displayed. So the decision was postponed. We have discovered that deferring few things to a later date (which could be actually indefinite) is a better idea than to get engaged in arguments. I feel this is probably one case where procrastination really helps. In-spite of our initial negative opinion about each other and doubt of any love in our relationship we married and never fought since then. It is like we had planted a half-dried seed but we both were desperate to get a beautiful plant out of it. So we took its utmost care and kept it hidden from small, petty fights until we realized that the almost dry seed is actually turning out to be a rose plant each day giving new colorful roses. Sure there are few thorns, but we pluck them out with the strength of our love. A few days later Piyush, my sweet hubby got the Gayatri Mantra bell when he happened to visit that place again to inquire about something. And whenever any new guests, especially my in-laws, come to our house he makes it sure that they listen to our holy bell as he likes it a lot. As for me, when I am struggling to get up early in the morning to get ready, it rings with the full chant, and with a smile and peace in my heart, I go to open the door for my maid. Three roommates discover the bond of togetherness and learn how things are not always as they seem to be. I wrote this poem after a long interval. Its another romantic rendition dedicated to my wonderful husband 8 months after the birth of our first child. This is my reflection on the emotional changes in me on becoming a mother and how my love for him has increased beyond anything measurable. Unedited version. 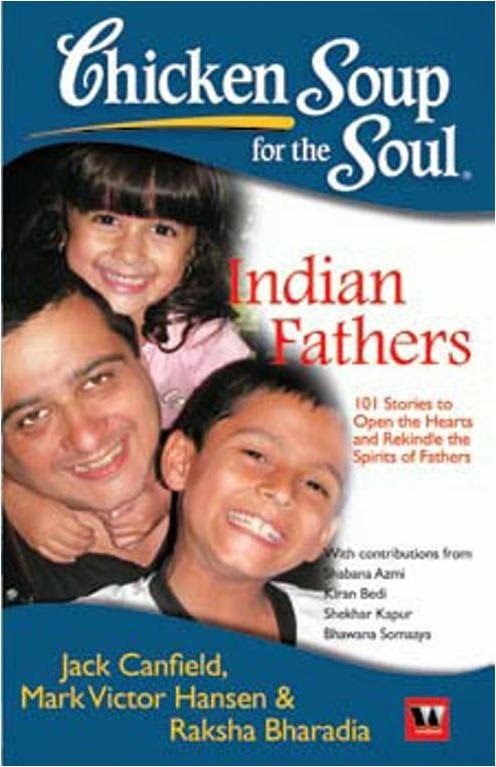 Published in "Chicken Soup for the soul- Indian fathers"- 2010 titled "Not a Superman, but my hero still"
'What do you want - a girl or a boy? ', asked the lady doctor from my father when I was on my way into this world. 'I have a boy and am blessed with a girl too. So, this time I leave it to GOD'. And pop I came in this world into his arms. 'My elder daughter is special because she's my first child, my second child is special because he's a son and third one is special because she is the youngest', he said proudly looking at little me. For me he has always been my superhero, the one who let us believe that we have a secure life while he took care of all the worries. My early childhood memories of my doting father is of a very confident, strong, daring, honest man with a heavy voice and some short temper. He has always been a man of authority like in any typical Indian family and we used to have goosebumps when he was in some bad mood. The day I received my first salary as a software engineer, coincided with the day my father got his last from his job of 30 years as a Banker, 29th November, his birthday and the day he got retired. So, here I came to my room with new dreams, aspirations and a new beginning while my father came back home the same day with a composed mind and a new end. He was the only enlightened mind in his family and a self made man. His job gave him the confidence that he can raise his family as he desired providing good education and good future to his kids, something which he heavily missed in his siblings. Our schools were the best in our small town and we three were considered the most decent kids in our locality and amongst our relatives. As the years passed my father's desires were fulfilled with my sister's masters in organic chemistry and her marriage to a good guy. My brother too became an engineer. 'What should I do with my salary papa? How do I transfer it to your account? ', I asked my father over the phone. 'No need dear, keep it with you and enjoy there', he said with assurance. I really had fun of my life with that money and never bothered asking him again. I was in one of the best world class training campus enjoying my stay in seven star accommodation and spent the money wherever I wished. Our expensive education never allowed us to spend even a penny on anything other than absolutely necessary. 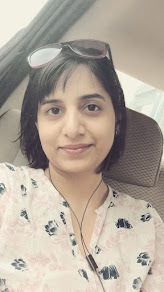 So, I was basking even more in this new glory of being a self dependent earning girl, while my father was experiencing a new post-retirement life with a fractured leg from a small accident. I visited parents after three months of my training on a leave and gifted my father a fine leather wallet and a Hyderabadi pearl set to my mother. My simple father who never had used a wallet in his life was quite amused at my choice. But as the days passed, I could see some change in his attitude or should I say it was hard to accept that my father now spent so much time staying completely at home. We all started giving him all sort of advice about what he could do next. His frequent irritation convinced all of us that he is not taking his retirement positively. His daughter is married in a good family, his son is also happily married and his youngest daughter too is having a good career ahead - that should make him proud instead of unhappy..., I started wondering. The childhood fear from his anger had transformed into frustration since the day we realised we were not kids any more. Things went on like this until one afternoon I had a fight with him over his depressive state. Being the youngest I was the pampered and stubborn child. So, unable to argue with me any further, my father became silent and retired to his room in agony. ...I hate to be here and wish to go back to my new world..., I was painfully thinking, ...why is everything like this, why is there no peace yet..., I can't see him going berserk like this, I want to see him happy, ENJOYING life - now that everything is settled..., several thoughts were flying haphazardly in my mind. I engaged myself in a conversation with my mother to keep myself distracted from the fast moving thoughts. We discussed how difficult those days were when papa was the sole bread winner. How the months for us meant balancing school fees, bills and papa's salary. 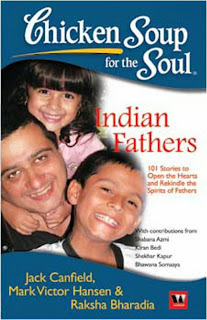 During the course of my conversation I started wondering about the present income of my father. It so appeared that since the construction of our house, my father was spending a substantial amount of money on our education and repaying the housing loan. The sole responsibilty had made him so vulnerable to decision making that he had not opted for pension in favour of some new government scheme that promised a large amount after retirement. His plans failed when the interest rates dropped and he was left with less than half of the amount he had hoped. I realized that apart from the savings for my marriage my father had very meagre sum left for his monthly expenses. Our responsibilities had left no time for him to plan some good investment or vocation for himself. My innocent mother confided to me that they were still in hand to mouth situation and their self respect never allowed them to ask money from their children. 'Keep it with you and enjoy there', my father's words echoed in my head. So much sacrifice for the kids! I held together myself, went to my father's room where he was sleeping or pretended so. 'Papa', he is still angry like a wife, I thought amusingly. 'Papa', I called again sitting beside him. He opened and looked through his one eye and then sat making a face like a child. He looked down at the wallet I was holding in my hand. 'I know you won't take but please for my sake, take this', I said while keeping some money into his wallet. His eyes were wide with surprise and he looked at my smiling face. His face was speaking volumes, 'Oh dear, I am afraid. How'll I manage and provide your mother.'. He sobbed and hugged me. 'Sorry papa', I said calming him down. Later in the evening we talked and this time I made sure I listened to him and so I understood the conflicts going inside my father's head. I also learned that we should never give up on our parents just like parents who never give up on their children. I saw him as a man who is walking on a path with no example to follow. For such a man he surely has achieved a lot, but that doesn't make him invincible. He can get afraid, he too can become nervous but he has to conceal it for he's the responsible one - the example for us to follow. I loved my father always but this incident taught me that my father is not a superman. And it is okay. Our bond since then grew stronger and I feel good that he finds it relaxing opening his heart to his youngest child. It is like we simply switch our roles for some moments and I listen to him like a father. He always knows what I need. So it was no wonder that the same year he found and married me to a wonderful guy whose perfect match with me made me love my father even more. As for his personal achievement my father is still on his way to self discovery with the support of my mother but he no longer worries about his finance, thanks to the revival of the pension policy and his able son. And he still uses the same wallet, while I have taken the charge of gifting him a new one every time! Marriage brings with it the thrill of shopping and I too did mine like a princess. The most important item on my list was my bridal lehenga. After looking at almost a hundred, I selected a beautifully embroidered bright red one. 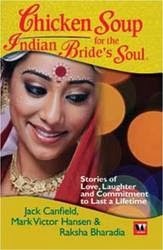 When I draped it on myself, I experienced the immense joy of becoming a bride. I wanted to look the most gorgeous woman on the planet that day. Finally, the D-day arrived. The wedding was taking place in Gwalior, hometown of my fiancé. My mother-in-law had booked the best salon of the city for me. Nothing can beat the pleasure of getting dressed as a bride and along with my sister, I reached the salon dreamy eyed. To my shock, there were almost thirty brides sitting there! My wedding date was supposed to be an auspicious one and it seemed like all the spinsters of Gwalior were getting married that same day! So here I was sitting amongst a horde of brides, waiting for my turn to get dressed up! It felt like I was a part of a mass marriage ceremony! As I sat and watched, I saw several girls getting transformed from ugly ducklings to beautiful swans. Suddenly, my sister got a call informing us that the Baraat had arrived! And here I was, looking the ordinary girl next door. My head started spinning and I yelled at the supervisor of the salon for so many bookings, delay and mismanagement. She panicked and hastily started doing my make-up herself. I was too confused and nervous to even notice what she was doing. This was my biggest day and I was supposed to look like a million bucks! But it had all gone terribly wrong. The lady was finished with me in fifteen minutes and there was clearly nothing great about the way I looked. There was nothing I could do now. As I walked towards the mandap, I felt all eyes were gaping at how commonplace I looked after keeping the groom and his family waiting for so long. My heart was heavy but I forced a smile. The next moment I saw my groom walking towards me. He looked serious. “Oh God! He is obviously as disappointed as I am.” I cringed. I stared at him until my sister nudged me to look down. A smile spread on my face like a cool breeze and I forgot everything that had happened earlier in the day. That moment onwards, I felt like a superstar. Even my wedding pictures show how radiant I looked that day. I may have been one of those thirty brides that day, but for my groom I was the only one! I was his bride forever! So Mr. Rushdie, what ultimately matters to a woman is to have a man who expresses his love for his woman with smile on his lips and truth in his eyes, all through the life. Tina is the ace team lead in the project. She joined her company, one of the best multinationals just two years ago. Her dedication at work made her the star performer and got her an early promotion. Her smartphone ensures that she’s 24/7 connected to the business even when she is at home or on a vacation. However, lately, Tina is finding it hard to keep up with the continuous work pressure as she’s climbing up the corporate ladder. She badly wants to reach to the top position but she no longer enjoys her job. She used to be good looking, but now she has these heavy pimples and marks that give her an ugly look. She used to be fit, but now she often cribs about what to wear to the office parties as only few dresses fit her nicely. She’s not into any relationship except with her parents as she find it extremely difficult to keep up with personal commitments. The problem with Tina is she is giving too much time to office, and too little to herself. It’s not that she does not think of taking care of herself, but her professional commitments keep her more occupied. Dhawan is flustered. He believes he’s overloaded with work. For past 4 appraisal cycles he is ending up with average grade in his project. He never misses any deadlines and does decent work. He even stretches in late nights to make sure his work finishes on time. But all his managers have complained that he barely meets their expectations. And they are not wrong as Dhawan is a busy man. He has scores of his favorite sports to keep track of, he needs to keep himself updated of share market and he loves playing games with the network of his online friends. He believes in multitasking. His family, especially his wife, too has lot of issues with him. Whereas his teammates take coffee breaks, he takes call breaks to make frequent calls to his family. He often misses his team building activities and does not find enough time to attend company events. Both Tina and Dhawan are stressed. They often crib about their life and look out for ways like binge eating, smoking and alcohol consumption to make themselves happy. They both, though have seemingly different problems, are similar in what they are missing. Proper work life balance! Paul Krassner remarked that anthropologists, use a definition of happiness that is to have as little separation as possible "between your work and your play". According to a survey conducted by the National Life Insurance Company, four out of ten employees state that their jobs are "very" or "extremely" stressful. Those in high-stress jobs are three times more likely than others to suffer from stress-related medical conditions and are twice as likely to quit. The study states that women, in particular, report stress related to the conflict between work and family. People like Tina have strong urge to showcase their brilliance. They constantly stretch themselves to get their team admiration. I know a friend who even goes to the extent of doing his colleague’s work. And no wonder though he looks fit but he already has started getting grey hair at an early age. Such actions also lead bosses to have high expectations which after a certain point of time becomes impossible to maintain. What people don’t understand is work is just a part of life and productivity comes only from a healthy mind and a healthy body and soul. I remember when I was working for an Indian IT giant, there were employees who would come to work early in the morning and would dedicatedly work for nine hours and at sharp 5.30 they would send their status mails and shut down their machines. Most of them usually would head towards the Employee Care Center, and there you would see them in their tracksuits hitting gym or engaged in various sports activities. My friend learned Salsa during training days when his peers were busy studying 24/7 during training. He cleared his training in flying colors whereas there were employees who struggled to clear their exams even though they stayed awake whole night studying. I prefer playing badminton and that would simply refresh my mind for the day apart from keeping me physically fit. Being engaged in extra curricular ensures peace of mind, and the soul gets nourished. Having said so, it does not mean one concentrates on devoting time to personal life or interests while putting the work commitments at last priority. Such acts can lead an employee tangled in a web of all sort of problems just like Dhawan. Being responsible and focus at work is always required. But the key to success is putting realistic goals and always speaking up any doubt on time. Proper planning is also required for perfect delivery. Remember nobody respects an employee who does not respect his work. After-all, you get paid for doing your work. * Discourage family to disturb during your working hours and vice-verse unless it is very urgent. * First thing first - at work and at home. * Use the famous quadrant system of prioritizing. * Set realistic goals and deadlines from the beginning. * Plan your day and track your status regularly. * Keep focus on work and avoid distractions during working hours. * Identify time-killers like commutation time and try to utilize it. If you travel by public transport than you may take quick nap, catch up with newspaper or respond to your e-mails on your smartphone. * If working from home, then set an office perimeter and office hours at home. * Leaves are an employee’s right so don’t feel guilty when you need one. * Plan your leaves in advance and keep your team well-informed. * Take healthy vacations periodically with family or friends i.e. vacations to relax and not to get tired. * Set Out of office messages and avoid taking business calls while on vacations. * Take proper sleep, meals and build an exercise regime to keep fit. * If you are a working mother, go for a domestic help for household chores like cooking, drying-folding-ironing clothes etc. * Remember that world has not yet ended inspite of missed deadlines, yet people generally do not succeed if they consistently miss their work commitments. The list goes on. The point is one should be aware of where to draw a line between work and personal space. Rewards and recognitions follow those who deliver great results by doing smart work and not slogging at the last hour. Proverbial hare still loses against patient tortoise who plans and works steadily. We are living in great times as many organizations too have realized the impact of work-life theory and are offering happy work culture by supporting various policies like part-time work, work from home, work sabbatical etc. Leaves like maternity, paternity, adoption and vacation have made it clear that companies like their employees especially women to have a healthy family life. Still, there are bosses who need to understand this concept and employees who need to make them realize the balance. Remember,right attitude propagates itself and make way for a great work culture!